There was a study that came out a couple weeks which stated that people who decorate early are generally happier. The journalist spoke to a Psychoanalyst who decided that this is mainly due to the childhood wonder and nostalgia that emanate from the holidays. Disney takes this nostalgia to a completely different level. They combine the nostalgia of the holidays with the nostalgia of Disney movies and characters. Not only are you watching Mickey Mouse sing and dance, but he’s also dancing to Christmas tunes and wearing a red velvet suit. There’s nothing like walking down Main Street covered in snow (see also: soap) with the castle in the distance draped in icicles. And they decorate for Christmas super early. The day after Halloween, pumpkins are down and wreaths are up. The thing is, the hype around this awesome party has made people feel they either need to scramble to do everything or have no idea where to start. Most people don’t have a solid plan and information needed so they can slow down and enjoy their festive evening. It doesn’t have to be a complicated and stressful mess to attend the party and you certainly don’t have to feel like you need to see everything. I’ll break down 15 of the most frequently asked questions when it comes to Christmas party which will help you understand the in’s and out’s of the event. In this, I will briefly cover snacks, shows, parades, and characters so you’ll feel more prepared. That way, you can narrow down everything you want to see and do from there! 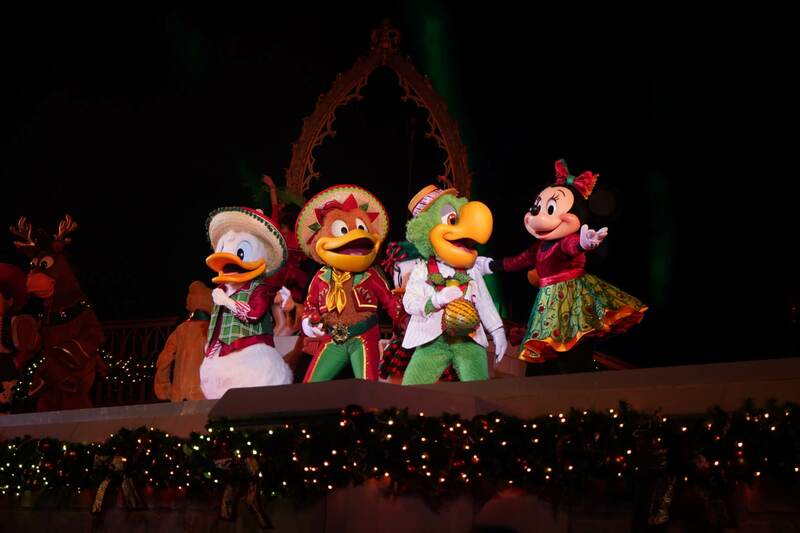 1 – Is Mickey’s Very Merry Christmas Party even worth the money? In my opinion, absolutely. If you’re booking in a package, you can book fewer days and enjoy the Magic Kingdom at the party instead of adding an extra day. If you’re an early riser, I suggest sleeping in the day of the party to make the most of your night. Arrive when party guests can enter the parks at 4:00 PM so you get a full 8 hours of park fun. 8 hours of park time if you enter at 4:00 PM when guests are permitted to enter and leave at midnight when the party ends. Free holiday treats. This includes cocoa, cider, cookies, and pretzels which are distributed at treat stations around the park. 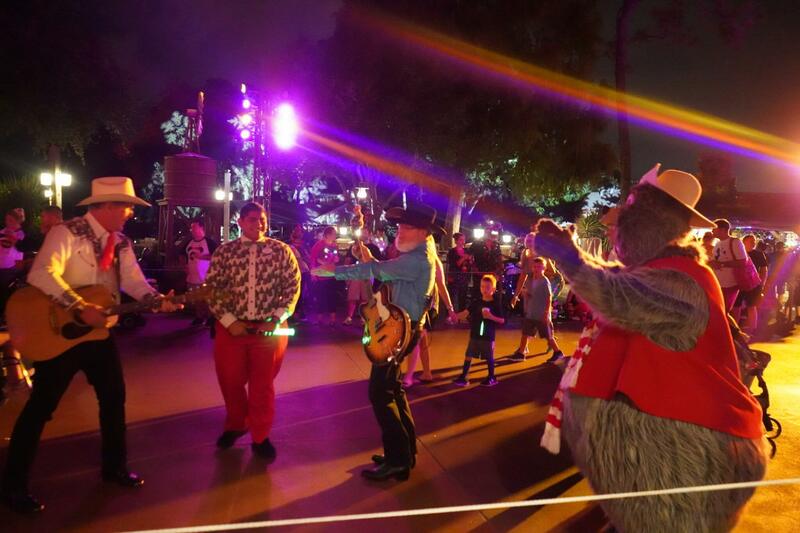 Special holiday castle show, parade, fireworks, and dance parties that are only available to view during the Christmas party. Slightly less wait times for rides and fewer crowds. It can still get very crowded so don’t expect the streets and ride queues to be empty. 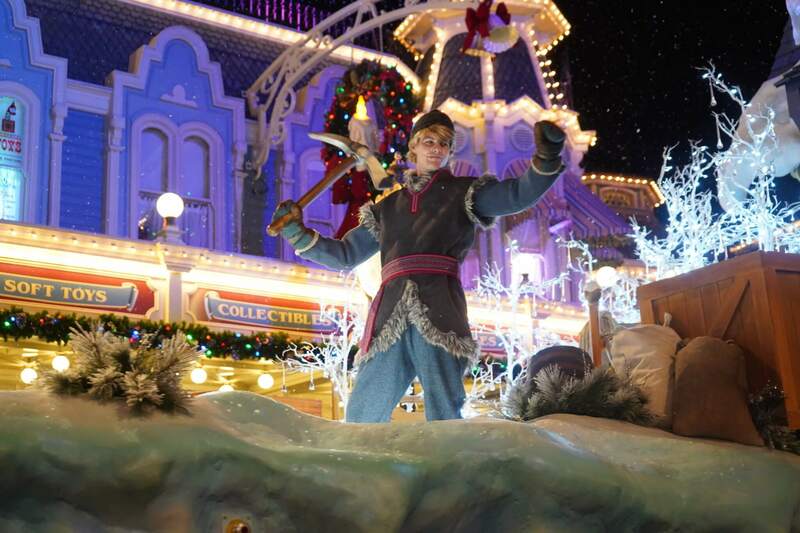 If you want a front-row seat for the castle Christmas show or parade, you will have to find a spot about 45 minutes to an hour before. If you don’t care to be up front, finding a spot behind some others about 20 minutes prior to the show will work fine. Rare character photographs or photographs with characters that are dressed in special holiday outfits. The characters have the longest wait times so I suggest lining up prior to the official party time. Some people try to line up at 4:00 PM when they arrive and others head over about an hour before around 6:00 PM. You’re not a night owl or have little ones who sleep at 8:00 PM. You will want to get a full night of park time in to make it with your dime. The parties end on December 21st so if you’re at the parks between December 22-December 31 they show the holiday parade and fireworks during regular park hours. Which means, you won’t need to buy a ticket to see either show. 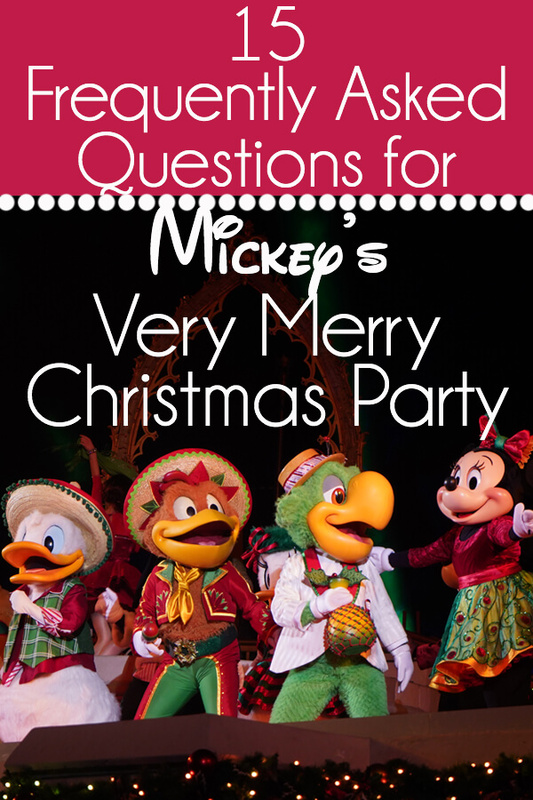 2 – What are the dates for Mickey’s Very Merry Christmas Party? 3 – How early can I get into the park and when Mickey’s Very Merry Christmas Party end? The party officially starts at 7:00 PM and non-party guests will leave at that time. Be sure to grab a party wristband on your way into the parks or at a wristband station if you’re already inside. This signals that you’re there for the party and Cast Members won’t allow you on attractions without one. Wristband stations are near Tortuga Tavern in Adventureland, Mickey’s PhilharMagic, and Monsters Inc. Laugh Floor. 4 – How much does the Christmas party cost? Tickets range from $99 to $125. The ticket price of $125 is for the last night of the event, December 21st. Check disneyworld.com for specific costs for each date. 5 – What is the best time to visit Disney World for holidays and the best dates to attend the party? My preference is to attend the party either the week before Thanksgiving or during the first two weeks of December. 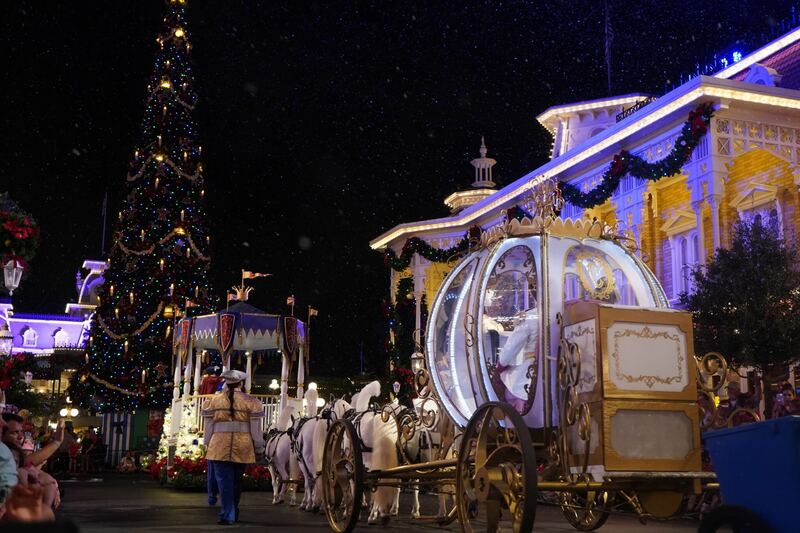 Holiday decorations and events will be in full swing by the first week of December. The first two weeks of November are less crowded than any other dates, but resorts and other parks outside of Magic Kingdom won’t be completely decorated. The week of Thanksgiving and the week of Christmas are very crowded, so I try to avoid visiting during that time. The resort decorations are slowly installed starting the first week of November and completed by mid-November. Grand Floridian’s gingerbread house was completed on December 14, 2018 and Epcot’s Festival of Holidays began November 18th, 2018. Both are a holiday must-do! 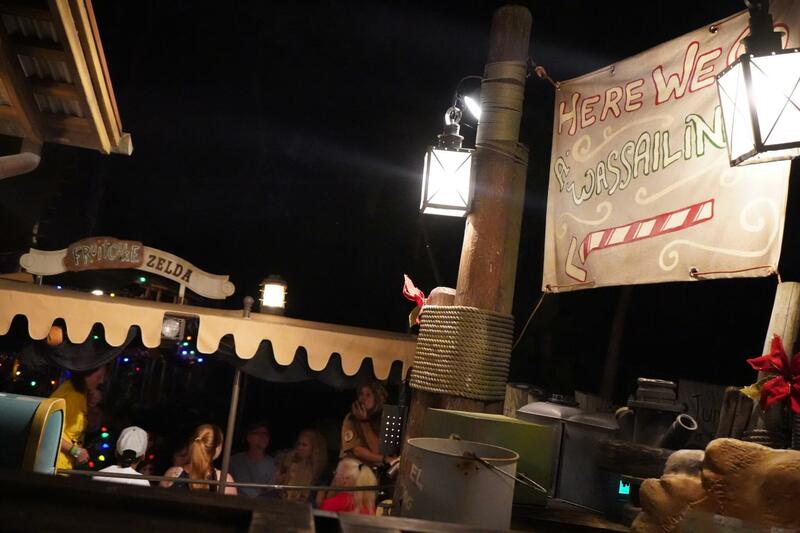 6 – Can I make FastPass+ reservations during the Christmas party? No, FastPass+ is unavailable during party hours. You can make them before the party starts between 4:00 PM – 7:00 PM. One thing to be aware of, if you don’t have an annual pass and have instead purchased a multi-day ticket, when you go to book FastPasses on your party day, “My Disney Experience” will think you’re using one of your full-day tickets at the Magic Kingdom. Therefore, if you want to book FastPasses on another day the system will say that you’ve run out of days to book passes. Example: I have a 3-day park pass and a ticket to the Christmas party to use on my 1st day of vacation. I booked FastPasses for the Christmas party at Magic Kingdom, Epcot on my 2nd day, and Animal Kingdom on the 3rd day. Now, when I go to book for Hollywood Studios on my 4th day, the system tells me I’ve run out of days to book FastPasses! In essence, I don’t advise booking during the Christmas party in advance. 7 – What time are the shows and parades? 8 – What attractions and rides are open during the party? 9 – What rare characters are available for pictures at the party? Expect to wait at least an hour or two for popular characters like the Seven Dwarfs and Sandy Claws dressed as Sandy Claws.Most of the common characters like Mickey & Minnie will be dressed in special holiday attire and rare characters will be out. Character lines sometimes dwindle towards the end of the night after the fireworks at 10:0 PM when large crowds leave. Try visiting characters after that time to avoid taking up most of your night waiting in a line. *Character schedules are expected to change during the party. 10 – Where can I meet Santa Claus? I know I just answered this, but Santa is often thought of as separate from the Disney characters so I’ll cover it again. 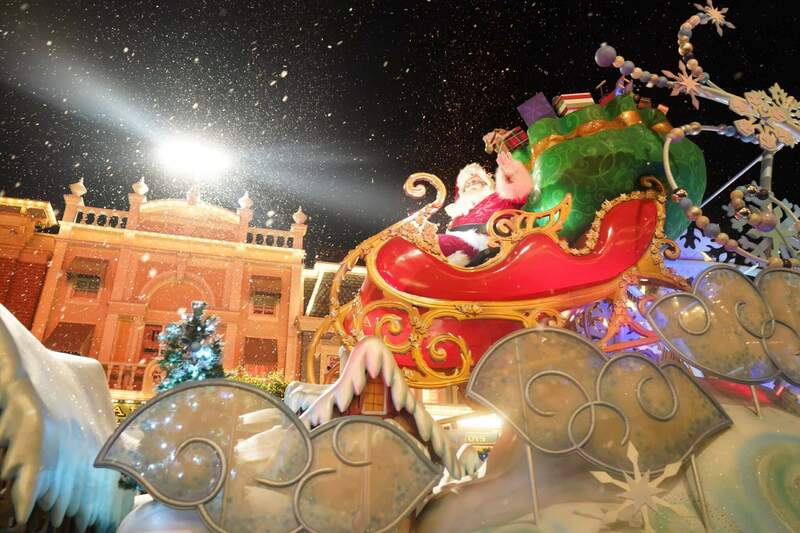 You can meet Santa during party hours on Main Street USA located between the Train Station and Guest Relations. During the day, Snow White meets guests in this same location. 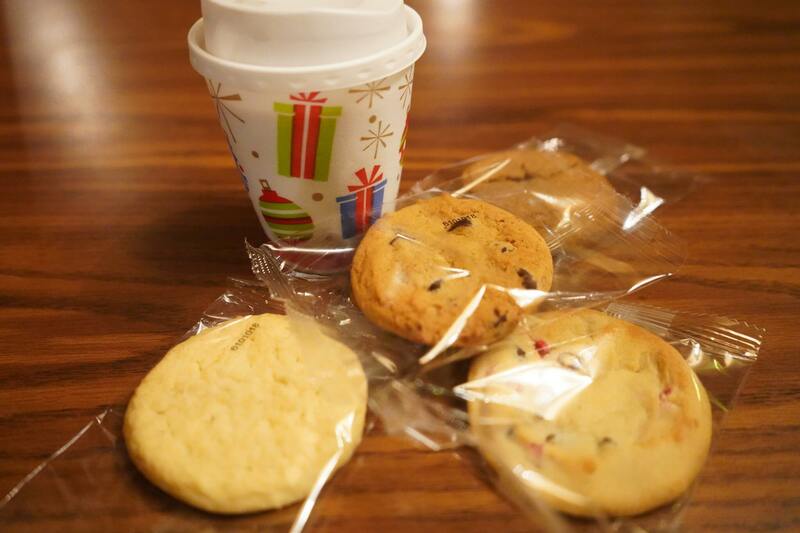 11 – What free Holiday Treats are provided at the Christmas Party? Pro-Tip: Head to Pinocchio Village Haus in Fantasyland to get ALL the holiday cookies offered at the party. You won’t have to stand and wait in multiple lines this way. They also have some dietary cookie treats available here like the eggless/vegan Just Cookie Dough. 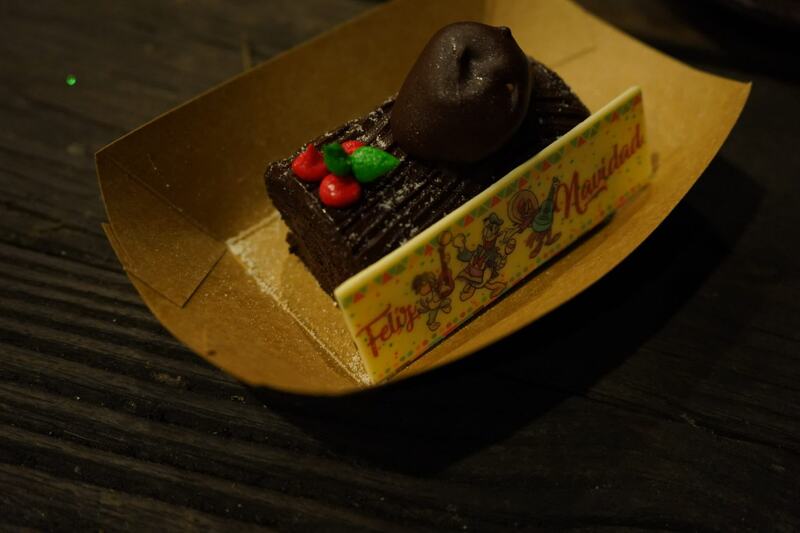 11 – Any other special holiday treats available at Magic Kingdom? Outside of your complimentary cookies and cocoa, there are a ton of special holiday food and beverages available for purchase. Feliz Navidad Nachos (Pecos Bill Tall Tale Inn) – red & green tortilla chips with turkey chili and queso sauce. 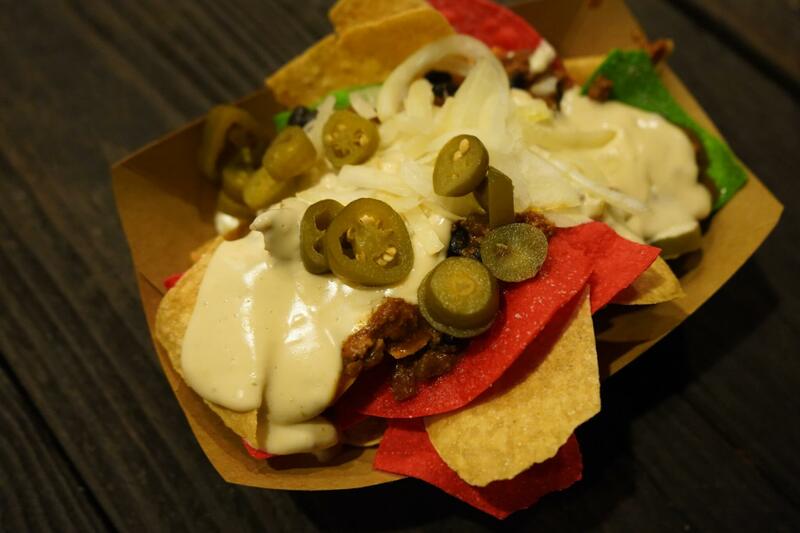 You can load up your nachos with all the goodies at the toppings bar! 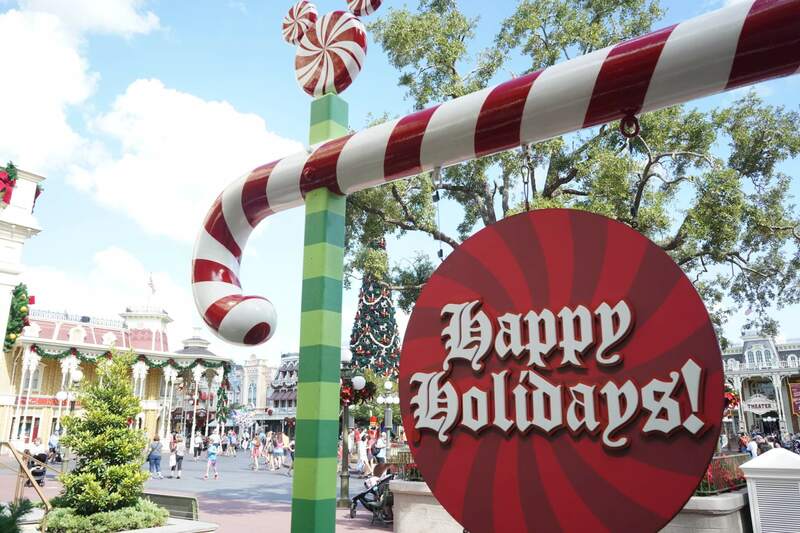 Read the complete foodie guide to holidays at Magic Kingdom here. Make a treat list and check it twice! But be sure to come back here. We’ve got more tips to cover! 12 – Are there any allergy friendly treats that are vegan or gluten-free available at the Christmas party? Yes, there are vegan options and other allergy-friendly treats at the party. New this year is the Just Cookie Dough available at Pinocchio’s Village Haus. Cosmic Ray’s serves Enjoy Life vegan cookies. 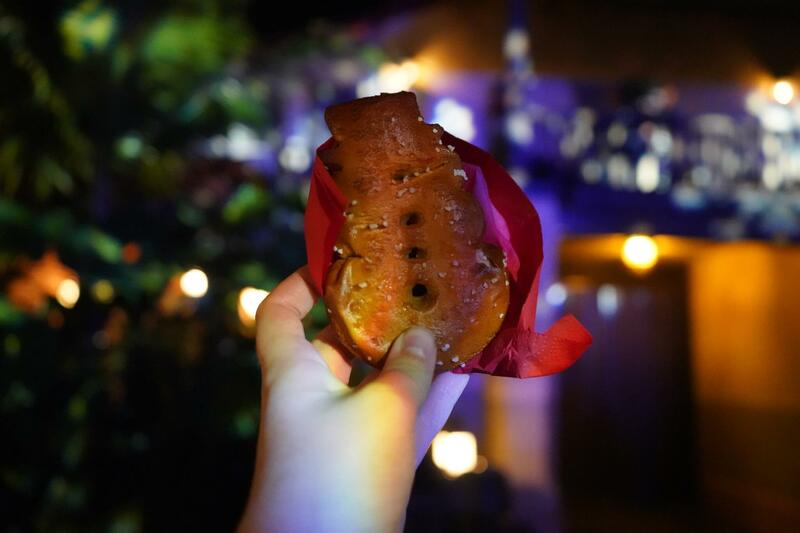 Just like the regular Mickey Pretzels, the holiday snowman pretzels are vegan as is the shaved ice. (The snow cone syrup may contain processed sugar as opposed to cane sugar.) There are a few gluten-friendly items available for purchase which you can find on the Disney World foodie guide linked above as well. 13 – Should I make dinner reservations during the Christmas party? If you want to have dinner in Magic Kingdom during the party, Be Our Guest, Cinderella’s Royal Table, and Crystal Palace are open during the parties. There is so much to see and do during the party that you most likely don’t want to spend your time sitting down for dinner. The are plenty of delicious places available at the nearby resorts if you don’t want to spend park time eating. We ate at Trail’s End in Fort Wilderness Lodge then took the boat transportation straight to the Magic Kingdom entrance. The monorail hotels will work great for this as well (Polynesian, Grand Floridian, and The Contemporary). 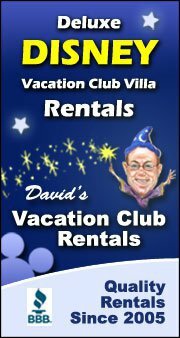 You can even park your car at the resorts for the duration of the party if you have a reservation that day. You can also pay extra for either of the parade or firework dessert parties described below. Make a reservation for either viewing party online. I personally don’t think either experience is worth the extra $100, but if you want to make it a fancy holiday evening, you might enjoy them. Tony’s Most Merriest Town Square Party – (Tony’s Town Square Restaurant) At $99 per person you can watch the Christmas parade from a reserved area and enjoy holiday treats, appetizers, and beverages (alcoholic and non-alcoholic). The dessert party lasts from 9:30 PM-midnight and you can enter and exit the viewing area as you please. Holiday Wishes Fireworks Holiday Dessert Party at Tomorrowland Terrace – This is a very similar experience to the parade viewing party. In addition to a clear view of the fireworks, you will receive treats like chocolate-covered strawberries, ice cream, fruits & cheese plates, hot cocoa, and other specialty holiday drinks. The cost is $84/adult and $50/child. 14 – Where can I find special holiday merchandise for the Christmas party? There are a few shops scattered throughout the park that sell the 2018 Very Merry Christmas Party merchandise. The widest selection for merch can be found at the Emporium on Main Street. Below, I’ve listed everywhere that special Christmas party souvenirs are available. The coolest and free souvenir you can find is the unique Sorcerer’s Magic Card available only to party guests. For 2018, the playing card is called the “four cawling birds” and features the tiki birds. You can pick them up at the Sorcerers of Magic Kingdom in the firehouse on Main Street. 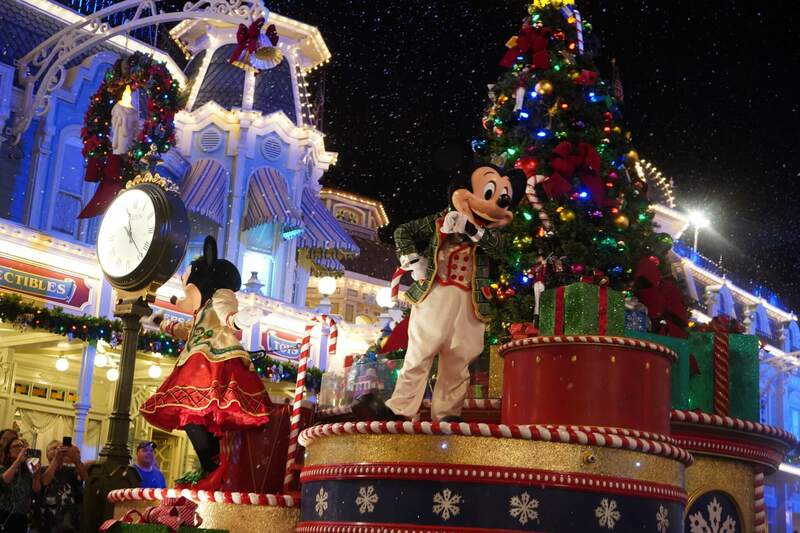 BONUS QUESTION – Does Disneyland in California have a Christmas party? No, Disneyland does not have a Christmas party. They do have special holiday offerings and shows like the Believe…in Holiday Magic firework show, it’s a small world holiday overlay display, and California Adventure’s Festival of Holidays with special holiday food and cocktails. You can read my complete guide to Christmas at Disneyland here. I hope you feel a little more prepared for the Christmas Party this year! I promise you it’s not as scary as it sounds. There is a TON to see and do so you won’t be bored, but don’t feel bad if you don’t get to everything. Even if you spend your evening drinking cocoa and staring at the 50 foot tree on Main Street it will be worth it, I promise. If you’re sticking around Disney property for more festivities check out my holiday date night ideas for an evening at Disney Springs. The Christmas Tree Trail is super cute and they’ve got some new holiday cocktails this year! Happy holidays, my friends!